At the same time, the air on the upper surface has a tendency to flow in toward the fuselage and off the trailing edge. 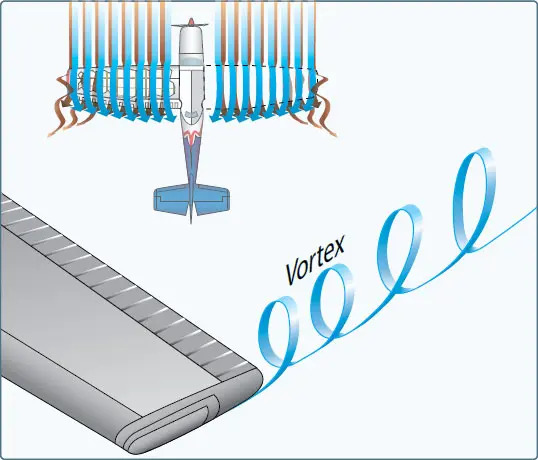 This air current forms a similar vortex at the inboard portion of the trailing edge of the airfoil, but because the fuselage limits the inward flow, the vortex is insignificant. Consequently, the deviation in flow direction is greatest at the outer tips where the unrestricted lateral flow is the strongest. As the air curls upward around the tip, it combines with the downwash to form a fast-spinning trailing vortex. These vortices increase drag because of energy spent in producing the turbulence. Whenever an airfoil is producing lift, induced drag occurs and wingtip vortices are created. Just as lift increases with an increase in AOA, induced drag also increases. This occurs because as the AOA is increased, there is a greater pressure difference between the top and bottom of the airfoil, and a greater lateral flow of air; consequently, this causes more violent vortices to be set up, resulting in more turbulence and more induced drag. In Figure 5-12, it is easy to see the formation of wingtip vortices. The intensity or strength of the vortices is directly proportional to the weight of the aircraft and inversely proportional to the wingspan and speed of the aircraft. The heavier and slower the aircraft, the greater the AOA and the stronger the wingtip vortices. Thus, an aircraft will create wingtip vortices with maximum strength occurring during the takeoff, climb, and landing phases of flight. These vortices lead to a particularly dangerous hazard to flight, wake turbulence. Avoid flying through another aircraft’s flight path. Rotate prior to the point at which the preceding aircraft rotated when taking off behind another aircraft. Figure 5-14. Avoid turbulence from another aircraft. A hovering helicopter generates a down wash from its main rotor(s) similar to the vortices of an airplane. Pilots of small aircraft should avoid a hovering helicopter by at least three rotor disc diameters to avoid the effects of this down wash. In forward flight, this energy is transformed into a pair of strong, high-speed trailing vortices similar to wing-tip vortices of larger fixed-wing aircraft. 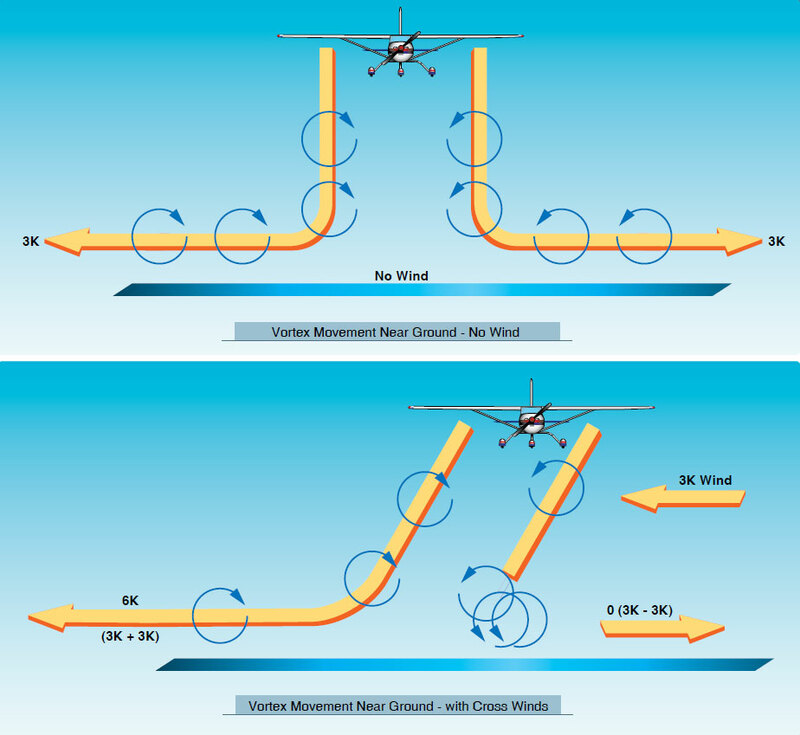 Helicopter vortices should be avoided because helicopter forward flight airspeeds are often very slow and can generate exceptionally strong wake turbulence. Wind is an important factor in avoiding wake turbulence because wingtip vortices drift with the wind at the speed of the wind. For example, a wind speed of 10 knots causes the vortices to drift at about 1,000 feet in a minute in the wind direction. When following another aircraft, a pilot should consider wind speed and direction when selecting an intended takeoff or landing point. If a pilot is unsure of the other aircraft’s takeoff or landing point, approximately 3 minutes provides a margin of safety that allows wake turbulence dissipation. [Figure 5-15] For more information on wake turbulence, see Advisory Circular (AC) 90-23, Aircraft Wake Turbulence.